Do you suffer from abdominal bloating; a chronic, nagging cough or sore throat; post-nasal drip; a feeling of a lump in the back of your throat; allergies; or a shortness of breath? If so, odds are that you are experiencing acid reflux without recognizing the silent symptoms. Even without the presence of heartburn or indigestion, more than 60 million people are suffering from acid-related disorders that are undetected or untreated--and leading to long-term health problems, including the rapid rise of esophageal cancer. Since there are no outward signs of acid damage and the typical symptoms might not be recognized, until now you might not have known how pervasive acid reflux is or that you have it. 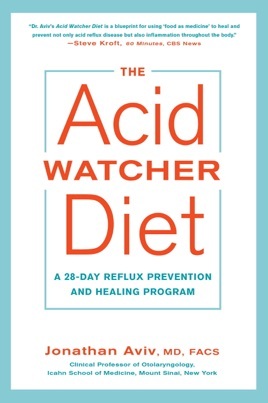 In The Acid Watcher Diet, Dr. Jonathan Aviv, one of the leading authorities on the diagnosis and treatment of acid reflux disease, helps readers identify those silent symptoms and provides his proven solution for reducing whole-body acid damage quickly and easily. His 28-day program includes a two-phase eating plan, menu guide, and recipes and works to immediately neutralize acid, stabilize pH levels, and relieve the inflammation at the root of acid reflux. Dr. Aviv's Power of Five rule will help readers discover the key foods that offer fast relief, and his Daily Six will reveal the foods to avoid (onion, tomato, citrus, and more). The Acid Watcher Diet's groundbreaking program is just what millions of readers need to reduce acid and balance their bodies and minds for optimal health. For years I suffered from silent reflux. I had a terrible cough and my throat always hurt. People didn't want to be near me because they thought I was contagious. It was difficult to sleep because of the cough. The medications I tried did not work, they were expensive and have awful side effects. My Gerd was getting intolerable when I found the book. It is written by a medical doctor and contains scientific research. The recipes are very good. Within 24 hours I felt better. I just finished the healing phase and am not seeing what foods that I can add back into my diet. This book is a miracle for me. I am healed. The Gerd drug industry is a 14 billion dollar business.No wonder a diet to cure Gerd is not encouraged.